Our customers have always been our biggest source of inspiration. We are constantly amazed by all the creative ways in which they adapt the features of Zoho Projects. A task, for example, can denote anything from a typical to-do work item, a book, or a recipe to a potential deal, a software build or a travel plan. So, we stepped up our game and decided to craft Zoho Projects 6: a highly customizable version that will more easily adapt to diverse project requirements. Here’s an account of what has released this week and a sneak peek of what’s coming up. Since tasks have come to represent different things for different companies, we are letting you get creative with the details too. While default fields like owner, description, start date, end date, and priority capture the most essential data, you can also create your own fields to communicate more specific information. Whether you want to include release dates, share review status, list out beneficiaries, mention version numbers or write down measurements, we’ve got you covered. Your new fields can be either text, numeric, date, or even picklists. Not all task statuses are binary. From Open to Closed, tasks may have to go through several different stages. To capture this flow, we are introducing custom task statuses. You can choose to either stick with the standard two or create your own intermediate stages. This helps you better capture the workflow of each of your tasks. When creating custom fields and statuses, having to redo the whole thing for each of your projects is both tiring and boring. To facilitate easier reusability, Zoho Projects 6 brings you Layouts. A layout acts as a template from which you can model your projects.The most basic design is the Standard Layout with all the default fields listed out. You can either add new sections and fields to this layout, or create different layouts yourself for different types of projects. You can also reuse the fields across different layouts. The simple drag and drop interface makes the process incredibly easy and quick. Once a Layout is in place with all the necessary fields and statuses, you can associate projects to it, so that all tasks in the project are built from the layout. Personal touches added to simple things like nameplates, letterboxes, and welcome mats are what makes your house a home. Give your Projects portal the face of your company and feel more at home, by mapping your portal to a domain name you own and by uploading your company logo. 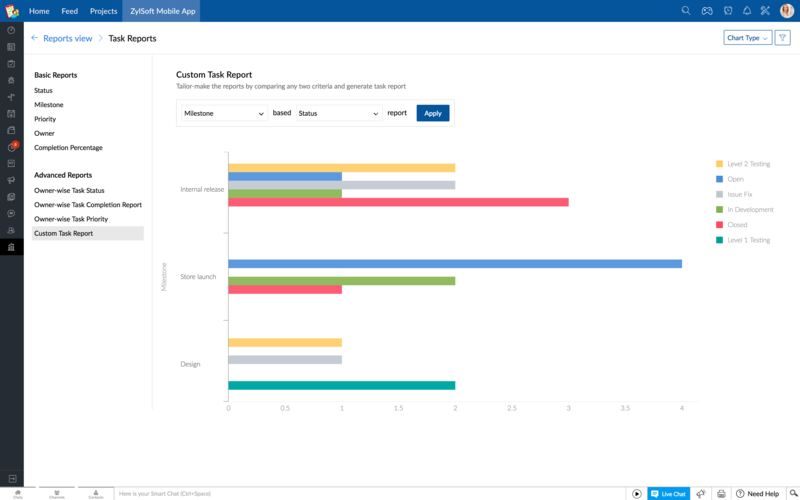 In addition to the basic reports, Zoho Projects 6 introduces a set of advanced task reports and options to create and view custom reports. Just select the two criteria you’d like to compare and voila, we’ll chart it. For eg, priority based status report, owner based milestone report and more. Joining this brigade of new features are small yet powerful updates that further enhance the app. A revamped Task details page. To accomodate the addition of new fields and sections, we have reorganised the design of the Task details page. The sections on the right take centre stage now with critical task info right next to the task name and with well organised and divided areas for description, fields, comments, documents, and the rest. Uniform design across all modules. With the introduction of customization for tasks, we’ve made sure the already existing bug custom fields also follow a similar structure. New and Searchable Setup page. The Setup page is your go-to place to configure custom fields, statuses and layout for tasks and projects. This page is now searchable, helping you to quickly locate the settings you are searching for. Custom field based reports. Along with the default fields, the custom fields also sync with Zoho Reports, so you can view and analyse reports based on the newly created fields. Kanban view by status. Zoho Projects 6 introduces a new Kanban view by status. Get a quick view of what state your task is in and also drag and drop tasks across cards to change the status. Enhanced task filters. You can filter your tasks based on the custom fields and statuses too. But, the list of all Zoho Projects 6 has to offer doesn’t end here. A line up of more customization options and new features await. And big names among them would be Custom roles and profiles, Custom Views for Tasks and Four types of task dependencies. We are as excited as you are. So, watch out this space in the coming weeks, as more of Zoho Projects 6 unfolds. Until then, explore these new features and tell us what you think! Also, here’s a video to give you a quick recap of today’s announcement.